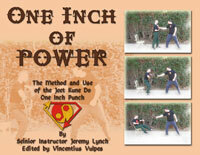 We proudly present, as our first publication, Jeet Kune Do Basics - By Jeremy Lynch. The principles and basic moves of the most effective martial art in the world are presented by one of its best teachers. Coming soon, a collection of quotable wisdom. On the horizon, a compilation of writings on the integrated life.